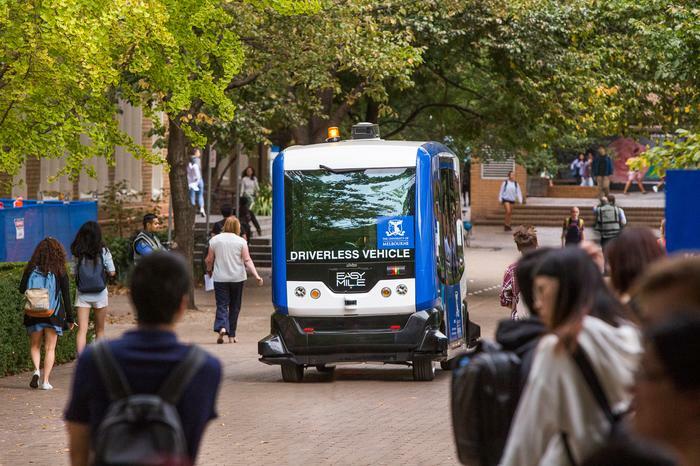 The University of Melbourne has taken delivery of an autonomous shuttle vehicle as part of its effort develop vehicle to vehicle, vehicle to vulnerable road user and vehicle to infrastructure communication systems. The battery-powered driverless electric bus – the EZ10 model produced by French company EasyMile – can carry up to eight passengers at speeds of up to 45 kilometres an hour. It will initially be used only in off-road, controlled environments. The arrival of the vehicle is part of a three-year collaboration between the university and EasyMile, which has given researchers access to the shuttle’s underlying technology platform “which will allow the vehicle to be regularly updated by researchers and improved as autonomous software advances” the university said. “Having our own autonomous vehicle ensures researchers can further improve autonomous vehicle safety and how this integrates with other transport options,” said University of Melbourne Professor in transport for smart cities Majid Sarvi. Although there is much excitement about the novelty of driverless vehicles, true innovation in the transport system comes from getting such vehicles and the road infrastructure to talk to each other, Sarvi explains. “The development of self-driving cars has attracted enormous investment globally and delivered technology that is performing well on uninterrupted freeways. The challenges start in mixed-use, urban environments,” he said. Late last year, the university launched its Australian Integrated Multimodal Ecosystem (AIMES) project, installing more than 1,000 sensors on traffic lights and light poles, buses, trams, cars and bicycles across a six-kilometre area of inner city Melbourne. The sensor network – across a grid bounded by Alexandra Parade, Hoddle Street, Victoria Street/Parade and Lygon Street – provides data on what types of vehicles are where, how fast they’re travelling, and incidents impacting the area, such as building work zones or accidents. AIMES also includes the 3D mapping of Drummond Street in Carlton. “This information is being used to develop algorithms that will eventually provide real-time traffic information, alternative routes and prevent crashes. It’s about getting our transport options to talk to each other – and one day, that will include driverless vehicles,” Sarvi, who is director of AIMES, said. EasyMile – which in February ran test drives of an EZ10 in Ipswich, Southeast Queensland – has established an innovation hub at the university. “This vehicle is a functioning example of what the future of mobility for end users looks like, combining the benefits and flexibility of the technology with the economy of group transportation,” said head of EasyMile Asia Pacific, Simon Pearce. 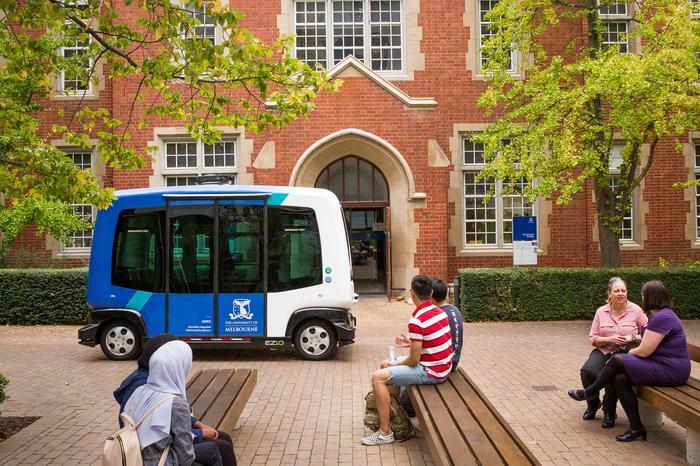 A number of Australian universities now have their hands on autonomous shuttles. In March last year, Curtin University claimed to be the first to trial a commercial driverless bus – from another French-company, Navya – as part of research around navigation satellite systems, road safety and mobility issues for people with a disability. Another Navya shuttle will tested at La Trobe University’s Melbourne campus this month. Flinders University last year received $4 million from the SA government's Future Mobility Lab fund for its five-year driverless shuttle project, which also utilises Navya-made vehicles.